You may remember a while back that I published a review of Maeve Binchy’s ‘Nights of Rain and Stars’. While I found it a pleasant read, I didn’t have that sucked in experience I like to get from books. When this happens, I will tend to avoid an author for a while rather than rush out to buy every single thing they have on offer. At the point of writing my last Binchy review, that is exactly what I had intended to do. However, when I was at home in August, I found ‘Evening Class’ lying around and after having had a quick glance at the back cover, I decided to throw it into my case to accompany me back to Berlin. ‘Evening Class’ begins with the story of Aidan Dunne, a teacher at Mountain View Community School. Having been overseen for the post of principal at the school, he is given the opportunity to set up an ‘Introduction to Italian’ evening class. The story develops to include the class pupils and their eccentric teacher, Signora. Us readers discover what brought them to enroll in the class in the first place, and how their stories intertwine. 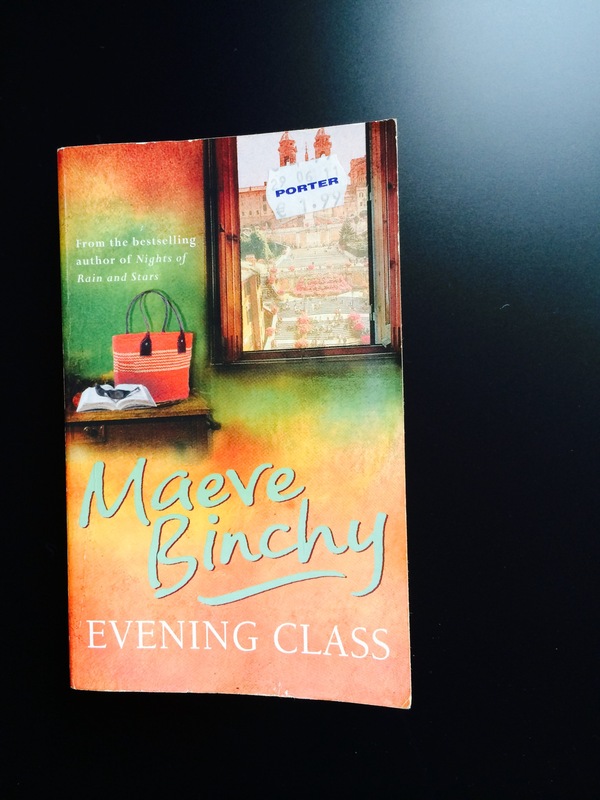 If there is one thing Maeve Binchy is good at, it is character development. When I first realized that each chapter of the story was broken down to focus on a different character, I was disappointed. I thought that because of this style of storytelling, the book would feel like a number of short stories rather than one intriguing one. I was wrong. Admittedly, at the start it was confusing for me to understand how each character was connected besides their attendance at the Italian class. Instead of landing us in the deep end right from the beginning, Binchy instead injected information about each character a little bit at a time into the story. I think this strategy helped become more involved with each character and not too overwhelmed with what was going on . These people brought a lot of excitement and drama to Dublin it seems! It also makes for less of a dull read as your mind works to untangle the chain of events. Binchy fans will also notice some characters from her other books popping up here and there. To have characters appear in a number of books let alone chapters, now that is character development at its best. I found myself connecting with each of the characters either because there were elements of their personality which were similar to mine, or because they reminded me of somebody else. This is a good feat for a writer considering the characters ranged from a rich divorcee to a timid young girl to a young man caught up in the underbelly of Dublin. Unlike my last disappointment, this book really sucked me in. Binchy has a wonderful way of writing which I can’t really explain. Motherly, maybe, like the stories of these people were being relayed to me by my grandmother. Another, probably biased, thing which appealed to me was that the book was based in my homeland, Ireland. Some of you may know that there were strong opinions at the time in Ireland regarding children before marriage and so on. These opinions, for me, were smoothly brought into the story without being too judgmental and condescending. I guess what I am trying to say is that Binchy expressed well the beliefs of clashing generations – no one person was perceived as completely right or wrong. There are some unanswered questions in ‘Evening Class’ which may be annoying for some readers. In fact, this sort of thing usually is for me but with this story, I somehow felt complete after reading it – I was satisfied with what I got. When I finished reading ‘Nights of Rain and Stars’ I felt I was done with Maeve Binchy. Now, I feel the opposite. I don’t have any more of her books sitting on my shelf though so let me know which book you recommend that I read next in the comments below.